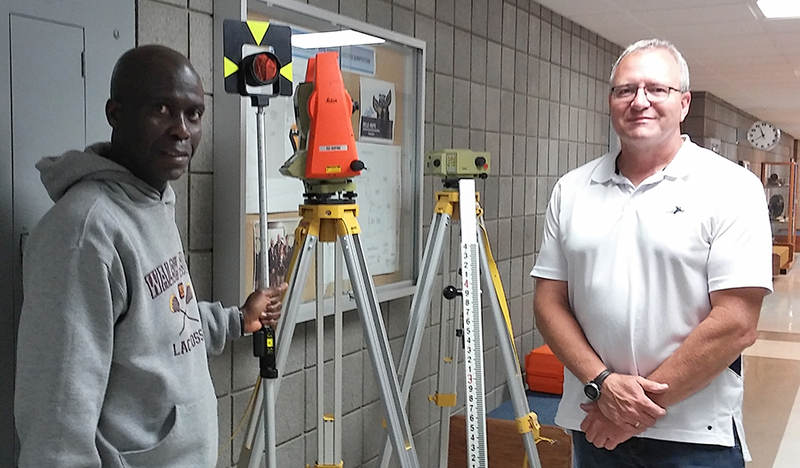 When Alhagie Darboe returns home to the Republic of The Gambia in June, he will be bringing not just newfound knowledge to share, but much-needed equipment on which he can help train the West African country’s next generation of surveyors. Darboe, who learned his surveying skills on the job, was sponsored by his government to come to the United States to study more advanced surveying methods and technology applications. While here, he has earned an AAS in Land Surveying. The new graduate is looking forward to the dual role that awaits him at home. He will teach “aspiring survey technicians” part time at GTTI with the equipment donated by UA. He will use the training workshop he developed during spring semester. And, Darboe will continue to be the lead surveyor with his employer, National Roads Authority. “Donation of this equipment means a lot to me and the young people back in The Gambia who will receive training,” notes Darboe. “As with most training institutions in developing countries, resources for training are constrained. The youths who will be trained using this equipment can contribute immensely in the future infrastructure development of the country by becoming qualified surveyors and engineers. “Having access to modern surveying equipment and software programs was what I enjoyed during my time here,” says Darboe. “Also, soccer being my hobby, I enjoyed watching the Zips men’s soccer team, especially the team of the 2015/2016 season,” he adds with a smile.